In one of my college classes, we read the book To Change the World by James Hunter, a prominent sociologist. He writes, “The practice of faithful presence… generates relationships and institutions that are fundamentally covenantal in character, the ends of which are the fostering of meaning, purpose, truth, beauty, belonging, and fairness…” This idea of faithful presence, specifically of combing presence and place, largely impacted me. This summer, I wanted to learn more about presence and investing in a community. This led to my internship at the New City Arts Initiative. The New City Arts Initiative believes that the arts can renew the city. The initiative is a collaborative non-profit fostering engagement with the arts in the Charlottesville, Virginia area. It believes that the arts can enrich communities and lives. Also, this non-profit is a regional group of the International Arts Movement in New York City, a movement that fosters an environment for wrestling with the deep questions of art, faith and humanity. 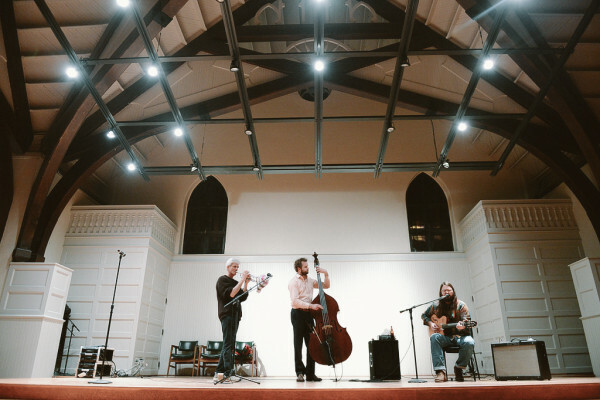 New City Arts develops relationships with other Charlottesville organizations, and promotes conversation, space and community. By fostering conversation, the initiative holds educational opportunities and discussions for artists, writers, musicians and everyone who is interested in creative endeavors. Through space, artists can show, perform and create work. Lastly, through community, people are able to connect with one another, build a community around the arts, and pursue beauty and justice in Charlottesville. New City Arts is located in The Haven, a renovated church and annex building. The Haven is a dynamic, multi-purpose community space that works to end homelessness. It operates a multi-resource day shelter for the homeless, and exists because everyone needs a place to start. The Haven enhances Charlottesville as a centralized location for resources by providing: a commercial kitchen, a day haven for the homeless, a community garden and a cultural and arts space in the downtown area. Read below for an interview with Maureen Brondyke, the executive director of New City Arts. 01 | How did New City Arts begin? New City Arts Initiative began as a cooperative of artists and ecumenical leadership whose hope was to offer their unique resources, connections, and vocations to meet needs in the Charlottesville arts community. The spirit of this group was strong, but without staff or funding, the means for accomplishing this original vision relied exclusively on board members. Today, our presence in the community has grown. We are a charitable organization with staff, interns, studio space, resident artists, and a gallery, but we maintain a “collective” feel, allowing community members to initiate grassroots programs that they perceive as important for Charlottesville artists. Our growth is primarily a result of community support, since the opportunities we provide are in conjunction with institutional partners. Why work alone, when you can share resources that allow for new opportunities for artists within our already-vibrant, local community? 02 | How does New City Arts seek to enrich and engage the community? New City Arts seeks to enrich and engage the Charlottesville community by establishing a creative network with relationships, thoughtfulness, and artistic practice at our core. Working through partnerships, we facilitate educational opportunities and group discussions for artists, writers, musicians, and all those interested in creative endeavors. 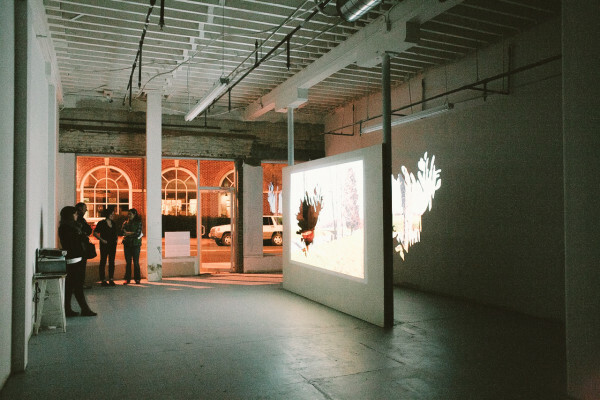 We maintain, curate, and support spaces where artists can show, perform, and create work. And we serve as a network for people to connect with one another, build community around the arts, and pursue beauty and justice together in our city. 03 | What are some ways that New City Arts hopes to see renewal in Charlottesville? We hope that Charlottesville becomes a thriving place for artists and creative workers to live and work. We hope artists find relational, financial, and physical support for their work from a community that values art and art-making. 04 | What are the local opportunities for artists? The opportunities we provide artists are spaces for them to work and exhibit, grow in their vocation, and connect with other artists and patrons. We host regular artist talks, a biennial arts conference, community meals, occasional concerts, and other arts events that engage community artists. Our primary, ongoing opportunities for artists are within the gallery we curate and a studio residency we facilitate. Our downtown gallery for local artists is in partnership with a radio station, WVTF and Radio IQ. Over 100 Charlottesville artists have exhibited here since 2010. In addition to having space to show their work, exhibiting artists are also featured on air prior to their show. Every opening is sponsored by Feast!, so there’s also decadent cheese boards and dips. More than 100 visitors usually go through our doors during an artist’s First Friday exhibit opening. We also facilitate a 10-month artist residency program in partnership with The Haven, a day shelter for the homeless and those in need. In addition to providing showers, laundry, computer access, storage, and a healthy meal for guests every day, The Haven offers connections to social service providers on-site and in the community. Together, The Haven and New City Arts have turned the second floor of The Haven into studio space in order to provide affordable working space for artists and integrate creative programming into the resources available to Haven guests during the day. The studio space functions as a place for artists to work and connect with other artists. 05 | What are some of the main events that New City Arts hold each year? Who are some of your partners? The New City Arts Forum is a biennial conference that provides challenging content and artistic engagement for the Charlottesville community with a high emphasis on relationship building. New City Arts hosted its inaugural Forum in April 2012 on “Art, City, and Society.” Our second Forum on "Art, Food, and Community" was held this past March. Artists, professors, curators, directors, chefs, writers, farmers, and foodies presented on a wide range of topics—Community Supported Art models, land-use art, food-based sculpture, art- and food-oriented social engagement, and everything in-between. The Forum always culminates in an exquisite meal in a unique place in order to build community among presenters, sponsors, performers, facilitators, and attendees. 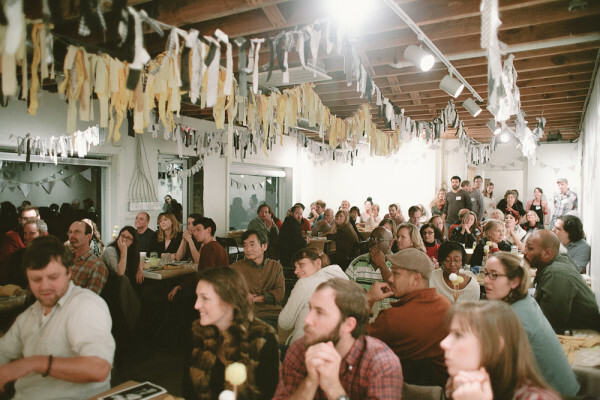 This past year, we also hosted four editions of Charlottesville SOUP, a seasonal public dinner series to support creative projects right here in Charlottesville. As a part of a national network of Soup events, attendees gave a $10 donation at the door and in return they receive soup, salad, bread, pie, and a vote. During the meal, a handful of community members made short presentations about their creative projects in need of funding. Attendees participated in a thoughtful dialogue with the presenters and with one another about the proposed projects over a delicious meal made from local ingredients. Then, each attendee entered a voting booth to cast his or her vote for which project to fund with the money raised from the meal that night. We’ve awarded $1,000+ grants to textile artists, a photographer, a string quartet, and a community organizer to pursue art projects that impact the Charlottesville community. We primarily work through partnerships, so to list all of our partners would be quite the endeavor. All community organizations, churches, local businesses, and individuals we’ve partnered with since 2009 are featured on our website, which hosts an archive of events we encourage browsing. 06 | How has New City Arts's location in The Haven, a community space working to end homelessness, shaped the initiative? 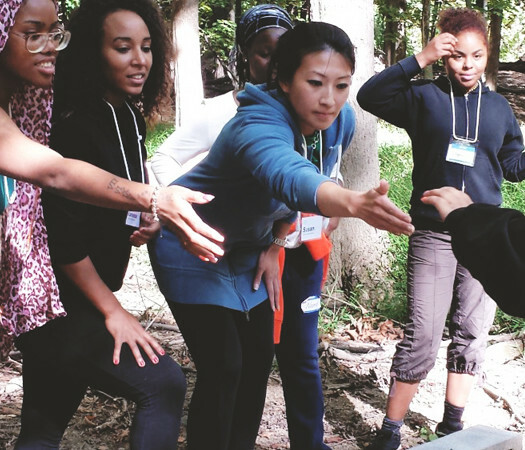 The residency at The Haven builds social capital in many ways; bridges are developed between the arts and the social service community, relationships develop between individuals who might not otherwise connect, and the conditions of homelessness and poverty directly and indirectly inform creative expression and thoughtful examination of the world. Our location at The Haven has primarily shaped how we define community. We’ve also met a lot of artists, musicians, and poets who work full time jobs in the social service sector, which has shaped our understanding of the artist’s vocation in many ways. 07 | What are some ways that New City Arts hopes to bring the arts to the homeless? How do the artists in residence invest in the homeless? Our artist in residence program at The Haven hopes to provide opportunities for Haven guests to pursue creative expression. Past artists have facilitated portrait drawing workshops, a collaborative mural for The Haven’s dining room, a Sumi Ink Club, and a memory mapping series. Most recently, our resident artists’ memory mapping series allowed Haven guests to physically document their experience of Charlottesville. Similar mapping activities were hosted by these same artists in local coffee shops, a downtown art space, and with the Charlottesville City staff, culminating in an exhibit of 90+ maps at our downtown gallery. These maps allowed all participants to creatively express how they experience our city. Each map was exhibited anonymously in order to create an inclusive picture of life in Charlottesville, generated from a diverse audience. The key to all of our artistic initiatives at The Haven is that the artists function as facilitators and organizers of creative expression; our resident artists provide creative ways for individuals to discover new forms of self expression. 08 | What are some upcoming projects or work New City Arts has in mind? Two of our upcoming projects this year are The Collector’s Series and the New City Artist Exchange. The Collector’s Series is a program we began in 2012 that we’re resurrecting due to its success. New City Arts is organizing a series of events in Charlottesville homes with hosts who are willing to talk to a 20 person audience about why, when, and how they purchased their art collection. This series debunks the myth that art is a luxury or only accessible to wealthy patrons. Attendees hear stories of art being received as a gift, or bartered for professional services, like financial consulting or web design. New City Arts is also organizing a 23-print exchange between 18 Charlottesville artists. Each artist will collate and receive a complete set of 18 works at a local brewery, Champion Brewing Company, in November. Five sets will be for sale through various events, including a public exhibit and an auction to benefit The Haven. This pilot program hopes to foster a community of local artists simply by getting new art into other artists’ hands. 09 | What inspires you most about the initiative? Personally, I am inspired when New City Arts helps members of our community (artists, patrons, etc.) thrive. A few examples come to mind. A SOUP attendee met her now-best-friend at the first SOUP dinner when they sat next to each other as strangers. Two artists who attended our New City Arts Forum decided to live in Charlottesville because they experienced the kind of community necessary to support their vocation. Our resident artist at The Haven was able to visit a member of his portrait drawing workshop when the guest was hospitalized. A SOUP grant recipient burst into tears when she told the story of how the micro-grant she had received was like a grand “welcome to Charlottesville” gesture, since she had moved here as a photographer about a year prior. We’ve even had at least one marriage result from event participation. Whenever artists sell work at WVTF; are able to work in the studio at The Haven; or can pursue a new risk, relationship, or creative challenge because of a resource we offer, I’m inspired by our vision. In addition, I’m inspired by the generosity that people, local businesses, and community organizations have poured into artists through New City Arts. When you experience that kind of selfless giving, it makes you want to give even more in return.